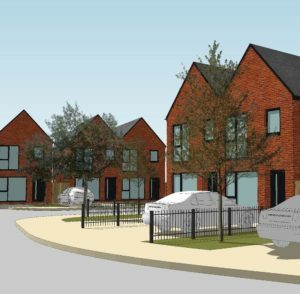 51 new affordable homes are to be built in Ormskirk, West Lancashire, as part of a mixed-use development which will create jobs in the area with a new Lidl supermarket and commercial units. Artist impression of the Atkinson Road development in Ormskirk. Housing association Chorley Community Housing, part of Jigsaw Homes Group, has been granted planning permission to build a mix of one, two and three bedroom homes on the former Atkinson & Kirby site in a joint application with Lidl and developer Citypark. The £6.5m residential scheme, funded by Jigsaw with grant support from Homes England, will consist of 20, 1 bed apartments including 10 for older people, 10 semi-detached three-bed houses and 21 semi-detached and terraced two-beds. The homes will be available for affordable rent and will include private or communal outdoor spaces, designated off-street car parking and some electrical vehicle charging facilities. This scheme is part of Jigsaw Homes Group’s wider plan to create c2,400 homes across the North West and East Midlands by 2022 through a range of tenures including affordable rent, shared ownership and market sale. Planning permission was granted by West Lancashire Borough Council on 10 January 2019.